Pianists looking for new and exciting Christmas arrangements will enjoy these renditions by Steve Calderone. 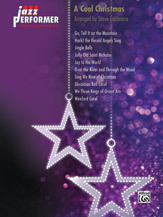 Jazz harmony meets traditional melody in this collection of 10 classic carols, perfect for holiday parties or recitals. Titles: Go, Tell It on the Mountain * Hark! the Herald Angels Sing * Jingle Bells * Jolly Old Saint Nicholas * Joy to the World * Over the River and Through the Wood * Sing We Now of Christmas * Ukrainian Bell Carol * We Three Kings of Orient Are * Wexford Carol.